The XTERRA World Tour returns to Australia with a three-race series beginning October 14, 2017 at the inaugural XTERRA East Gippsland on the Mitchell River in the state of Victoria. The new XTERRA Australia Series will be organized by Elite Energy Events, one of Australia’s premier event management specialists, who helped produce the XTERRA Asia-Pacific Championship in New South Wales each of the previous two years. The XTERRA World Tour returns to Australia with a three-race series beginning October 14, 2017 at the inaugural XTERRA East Gippsland on the Mitchell River in the state of Victoria. The new XTERRA Australia Series will be organized by Elite Energy Events, one of Australia’s premier event management specialists, who helped produce the XTERRA Asia-Pacific Championship in New South Wales each of the previous two years. Other events in the series include a return to the former Asia-Pacific Championship race site in Callala, Jervis Bay, New South Wales on December 8, and then XTERRA Townsville (Queensland) – famed for its amazing mountain bike trails – on June 16, 2018. The XTERRA Australia Series will award points and crown champions to elite and age group racers in five-year increments. Every race counts. Future events pending. Athletes need to race at least two XTERRA Australia series events to be eligible for series honors at the end of the season. Elite Energy is one of Australia’s premier event management specialists and have produced many of Australia’s leading multisport events. Their mission is to “make events memorable”. Quality is a vital component in the development of events and their goal is to satisfy the needs of sponsors, competitors, the triathlon industry, and the public in a safe, healthy, and memorable atmosphere. 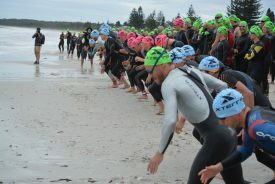 Learn more at www.xterraaustralia.com.